1. Now here's the ultimate in camp. Futuristic cars looking to run over pedestrians for points. How did they know what the European roundabouts are all about back then? Of course, now they highlight Sylvester Stallone on the cover but back when it came out he was a total nobody. 2. Who said Mark Hammill didn't do anything besides Star Wars! Ok, perhaps he shouldn't have, but then we wouldn't have this campy classic. 3. Gumball Rally. You know, I'm not even going to mention those damned Burt Reynolds movies like Smokey and the Bandit or Cannonball Run (ooops, I guess I did) but they were just pale copy cats to the original. This one has Raul Julia in one of his first movies as an Italian eccentric who immediately rips off the rear view mirror and states "what's behind me is not important". Now that's academy award performance material right there. Makes me want to weep. 4. Eat My Dust. 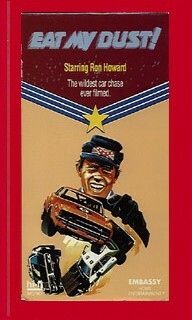 Yes, before Mr. Director Ron Howard got all old and bald on us, he did a couple of obscure car chase movies. Good brainless carnage here. 5. Dirty Mary Crazy Larry. 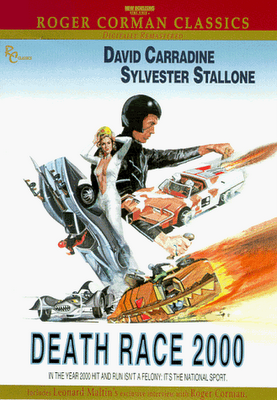 Hey, this one has Peter Fonda in it. Yep, traded in the chopper for a muscle car. Great ending on this one. 6. 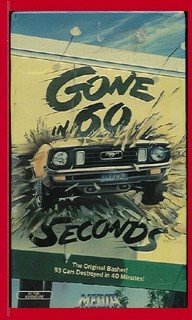 Gone in 60 Seconds (the original, not that stupid modern version). Come on, this one advertises right on it: "93 cars destroyed in 40 minutes". What could be better than that?!!! 7. 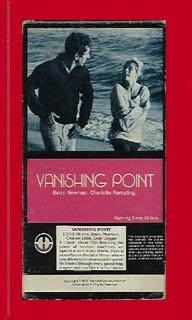 Vanishing Point. Great one here. Any movie with a character named "Super Soul" in it has to be good, right? 8. 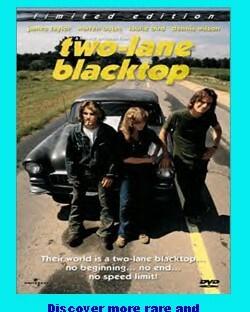 Two-Lane Blacktop. An odd one with James Taylor (yes, that country/pop/folk singer that was married to Carly Simon for two or three days before they went "What were we thinking!") as one of the main characters if you can believe it. Great Warren Oates appearance. I've seen all but the last two...in the movie theaters when they were first run. 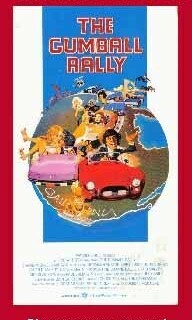 I loved Gumball Rally. You have to throw in the bad Italian accent to make that Raul Julia line work. I was always pissed at JT for marrying Carly. I wanted her for myself. 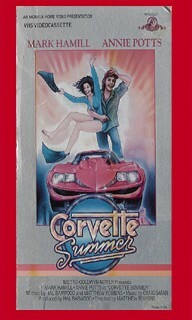 Only one I saw was Corvette Summer, it was only so-so.